Shabazz Nagee Muhammad (born November 13, 1992) is an American professional basketball player for the Minnesota Timberwolves of the National Basketball Association (NBA). He was selected in the first round with the 14th overall pick of the 2013 NBA draft after playing one season of college basketball for the UCLA Bruins. Muhammad went to Bishop Gorman High School, where he was named Mr. Basketball USA and Naismith Prep Player of the Year in his senior year. He was one of the top rated college basketball recruits in the class of 2012. In his only season with UCLA, he earned All-American honors and was named to the all-conference first team in the Pac-12; he also voted Pac-12 co-Freshman of the Year . Muhammad was born in Long Beach, California to Ron Holmes and Faye Muhammad. Holmes was a 6-foot-5-inch (1.96 m) standout, four-year starting point guard for the USC Trojans men's basketball program in the 1980s. He went by names including Ronald Muhammad, Ron Shabazz and Rashad Muhammad, but settled on Ron Holmes after never finishing his religious conversion. His wife, Faye, was a point guard and track star at Long Beach State. Muhammad was the second of three children. His older sister Asia became a professional tennis player, and younger brother Rashad played basketball in high school. When Muhammad was six years old, he was diagnosed with Tourette syndrome. Muhammad attended high school in Las Vegas Valley in Nevada at Bishop Gorman High School, a Catholic high school with a $12,000 annual tuition that possessed a competitive athletics program. He became one of the few freshman to make their varsity basketball team. In his junior year, Muhammad led Bishop Gorman averaging 25.1 points and 7.7 rebounds for the season. Muhammad was also named the 2011 Gatorade Player of the Year for the state of Nevada. Muhammad was the 2011–12 high school diary keeper for SLAM Magazine. Muhammad played in the 2012 McDonald's All-American game, where he led the West team to a 106-102 victory over the East team, and was named the MVP of the game with 21 points and 6 rebounds. Muhammad also participated in and won the 2012 Powerade Jam Fest Dunk Contest. He was rated as the No. 2 player in the class of 2012 in the ESPNU 100, the No. 2 player by Scout.com, and the No. 1 player by Rivals.com. CBS college basketball analyst Greg Anthony called Muhammad a "once-in-a-generation talent." Muhammad with UCLA in 2012. Boasting scholarship offers from scores of basketball programs, Muhammad's final list of schools was Duke, Kentucky, and UCLA. On April 11, 2012, Muhammad announced he would attend UCLA. Muhammad was declared ineligible to play hours prior to UCLA's 2012–13 season opener against Indiana State due to alleged violations involving the NCAA's amateurism rules surrounding unofficial university visits. The NCAA ruled he had received benefits for travel expenses and lodging from family friend Benjamin Lincoln, who had befriended Muhammad's father when Muhammad was in seventh grade, during unofficial visits to Duke and North Carolina. After missing three games and an appeal by UCLA, he was reinstated, and his family was required to repay approximately $1,600. Days before his reinstatement, several media outlets reported the boyfriend of the NCAA’s lead investigator boasted publicly that the NCAA would find him ineligible eight days after the investigation commenced. The NCAA subsequently fired the investigator that was involved in the case. Muhammad scored 15 points off the bench in his debut in a 78–70 loss to Georgetown in the semifinals of the Legends Classic. He became a starter in the next game against Georgia, and he scored a game-high 21 points in a 60–56 win in the Classic's consolation game. Muhammad would then get a college-high 27 points, including a game-winning three pointer, in a 97-95 overtime victory against No. 7 Missouri. He scored a game-high 23 points in an 84–73 road win over No. 6 Arizona. Muhammad received national recognition, earning second-team All-American honors from Sporting News and a Freshman All-American selection by the United States Basketball Writers Association (USBWA). He was also named to the All-Pac-12 first team, and was voted the Pac-12 co-Freshman of the Year along with Jahii Carson of Arizona State. Muhammad finished the season averaging 17.9 points, 5.2 rebounds, 0.8 assists, 0.7 steals, and 0.1 blocks per game. He shot 44.3% from the floor and made 71.1% of his free throws. While his scoring ability was unquestionable, he was not the flashy offensive player that was expected upon his signing. Muhammad struggled in the postseason, shooting 39.7 percent (23-for-58) and averaging 15.3 points in four games. He was 0-for-10 on three-point field goals. During the season, he focused on shooting and rarely passed the ball. He was also a weak defensive player, though he did show improvement. On April 16, 2013, Muhammad declared he would enter the 2013 NBA draft. While he began his college career projected as a top-three draft pick, his stock fell to being viewed as a back-end lottery pick. Muhammad was drafted 14th overall by the Utah Jazz; afterwards, his draft rights were traded to the Minnesota Timberwolves along with the 21st pick, Gorgui Dieng, in exchange for the ninth pick, Trey Burke. While attending the NBA's rookie transition program in August before the season, Muhammad was sent home due to a rules violation. On January 5, 2014, he was assigned to the Iowa Energy of the NBA Development League. In four games with Iowa, he averaged 24.5 points, shot 57.1% from the field, and had 9.8 rebounds per game. He played in the D-League Showcase, and was named to the All-Showcase Team. On January 13, he was recalled by the Timberwolves. On February 8, with three teammates out injured, Muhammad scored 12 points in a 117–110 loss to the Portland Trail Blazers. After playing sparingly for the Wolves most of the season, it was his first game playing over 10 minutes. On February 25, Muhammad played a season-high 24 minutes and scored a season-high 20 points in a 110-101 win over the Phoenix Suns; he scored 10 points while playing the entire fourth quarter, when he also had five of his six rebounds. On April 5, he sprained the medial collateral ligament (MCL) of his right knee against the Miami Heat, which forced him to miss the remainder of the season. He averaged 3.9 points per game for the season. During the offseason, Muhammad lost weight and tuned his offensive game, and he enjoyed an improved season in 2014–15 before suffering injuries. On December 30, 2014, Muhammad scored a then career-high 30 points in a 100–94 loss to Utah. On January 9, 2015, he missed the fourth quarter against the Milwaukee Bucks after suffering a strained external oblique. The injury sidelined him for weeks after he had been performing well, averaging 16.9 points and 4.9 rebounds over his previous 20 games. Muhammad was selected to participate in the Rising Stars Challenge during the 2015 NBA All-Star Weekend. On February 21, 2015, he was ruled out for the rest of the season after requiring surgery for a torn ligament in his middle finger. On October 21, 2015, the Timberwolves exercised their fourth-year team option on Muhammad's rookie scale contract, extending the contract through the 2016–17 season. On April 5, 2016, he scored a career-high 35 points in a 124–117 overtime win over the Golden State Warriors. Muhammad's uncle, Stephone Paige, played nine seasons in the National Football League (NFL) with 377 career receptions. His aunt, Robin Holmes, was a four-year starter for Cal State Fullerton. On March 22, 2013, it was revealed in a report from the Los Angeles Times that Muhammad was actually born exactly one year earlier than his thought-to-be birthday of November 13, 1993. A copy of his birth certificate on file with the Los Angeles County Department of Public Health shows that he was born at Long Beach Memorial Medical Center exactly one year earlier, which made him 20 years old at the time. Los Angeles Times assumes that this was to make Muhammed look better "competing against younger, smaller athletes, particularly in the fast-growing years of early adolescence", and compared the case to that of baseball's Danny Almonte. While Muhammad's father said the younger age in UCLA's media guide was "a mistake", numerous sources online show that Muhammad had been passing himself off as younger for years. Muhammad with Bishop Gorman High School in 2011. 1 2 3 Bensinger, Ken (March 22, 2013). "NCAA to NBA millions: UCLA star's father mapped out a dream". Los Angeles Times. Archived from the original on May 31, 2013. 1 2 Foster, Chris (April 12, 2012). "Shabazz Muhammad looks to add to family history". Los Angeles Times. Archived from the original on May 31, 2013. ↑ Bolch, Ben; Holmes, Baxter (April 12, 2012). "There's quite a buzz about Shabazz Muhammad". Los Angeles Times. ↑ Holmes, Baxter (January 2, 2013). "Shabazz Muhammad's 'killer instinct' at play". Los Angeles Times. Retrieved January 2, 2013. ↑ "Not Looking Back: Shabazz Muhammad overcomes disorder in becoming one of nation's best players". DailyBruin.com. March 1, 2013. Retrieved March 1, 2013. ↑ "Shabazz Muhammad". ESPN.com. Retrieved 2011-07-15. ↑ "Shabazz Muhammad, Diary 1". SLAMOnline.com. October 12, 2011. Retrieved March 29, 2012. ↑ Stephen Boyle (March 29, 2012). "Muhammad leads West to McDonald's win, grabs MVP award". SI.com. Retrieved March 29, 2012. ↑ "2012 College Basketball Recruiting Rankings - ESPNU 100". espn.go.com. Retrieved 2011-07-15. ↑ "Scout.com College Basketball Team Recruiting Prospects". Scouthoops.scout.com. Retrieved 2011-07-15. ↑ "The Rivals150 2012 Prospect Rankings". Rivalshoops.rivals.com. Retrieved 2010-07-15. ↑ Prisbell, Eric (November 17, 2012). "NCAA reinstates Shabazz Muhammad". USA Today. Retrieved November 17, 2012. 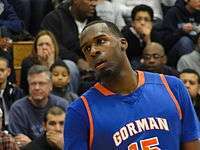 ↑ "Vegas basketball prep star Shabazz Muhammad picks UCLA over Kentucky, Duke". washingtonpost.com. 11 April 2012. Retrieved 12 April 2012. ↑ "Shabazz Muhammad to UCLA". espn.go.com. 11 April 2012. Retrieved 12 April 2012. ↑ "Shabazz Muhammad ruled ineligible for UCLA Bruins". espn.go.com. 13 November 2012. Retrieved 13 November 2012. ↑ Nocera, Joe (November 19, 2012). "Race and the NCAA". The New York Times. Retrieved November 19, 2012. ↑ Yoon, Peter (November 16, 2012). "Shabazz Muhammad eligible to play". ESPN.com. Archived from the original on November 16, 2012. ↑ Holmes, Baxter (November 14, 2012). "Overheard conversation suggests NCAA prejudged Shabazz Muhammad case". Los Angeles Times. Retrieved November 14, 2012. ↑ "Report: NCAA fires UCLA investigator". ESPN.com. December 20, 2012. Retrieved December 20, 2012. ↑ Spector, Jesse (November 19, 2012). "UCLA vs. Georgetown: Shabazz Muhammad's debut ends in defeat". sportingnews.com. Retrieved November 20, 2012. ↑ Holmes, Baxter (November 21, 2012). "Shabazz Muhammad shows he's a quick study as UCLA beats Georgia". Los Angeles Times. Archived from the original on November 21, 2012. ↑ "Shabazz Muhammad's 3-pointer in OT gives UCLA a 97-94 upset of No. 7 Missouri". WashingtonPost.com. December 29, 2012. ↑ "UCLA rides huge start to surprise No. 6 Arizona". ESPN.com. Associated Press. January 24, 2013. Archived from the original on January 25, 2013. ↑ "Shabazz Muhammad Earns All-District, All-America Acclaim". UCLABruins.com. March 26, 2013. Retrieved October 9, 2014. ↑ Yoon, Peter (March 11, 2013). "Shabazz Muhammad, Larry Drew II named All-Pac-12". ESPN.com. Archived from the original on March 11, 2013. ↑ "Shabazz Muhammad ESPN Bio". ESPN.com. Retrieved May 17, 2013. 1 2 3 4 Yoon, Peter (April 16, 2013). "With draft stock dropping, Muhammad decision is a no-brainer". ESPN.com. Archived from the original on May 31, 2013. 1 2 3 Zgoda, Jerry (February 26, 2014). "Muhammad's career night helps Wolves rally past Phoenix". Star Tribune. Archived from the original on February 13, 2014. ↑ "Shabazz Muhammad to turn pro". ESPN.com. Associated Press. April 16, 2013. Archived from the original on April 17, 2013. ↑ "Utah Jazz grab national player of the year in Michigan guard Trey Burke". Washington Post. 2013-06-27. Retrieved 2013-06-28. ↑ Baumgardner, Nick (2013-06-27). "On the move: Trey Burke ends up with Utah Jazz after being traded by the Minnesota Timberwolves". MLive.com. Retrieved 2013-06-28. ↑ "Muhammad sent home from rookie transition program". NBA.com. August 7, 2013. Retrieved August 7, 2013. ↑ "Wolves Assign Shabazz Muhammad To Iowa Energy". NBA.com. January 5, 2014. Retrieved January 5, 2014. 1 2 "Wolves Recall Shabazz Muhammad From Iowa Energy". NBA.com. January 13, 2014. Archived from the original on February 23, 2014. ↑ Youngblood, Kent (February 9, 2014). "Shorthanded Wolves fall short". Star Tribune. Archived from the original on February 23, 2014. ↑ Robson, Britt (February 27, 2014). "Wolves will enter March with flickering hopes — or flickering out?". minnpost.com. Archived from the original on March 13, 2014. ↑ Feldman, Dave (April 7, 2014). "Two disappointing Timberwolves to miss rest of disappointing season". probasketballtalk.nbcsports.com. Archived from the original on April 22, 2014. ↑ "Shabazz Muhammad out for season". ESPN.com. Associated Press. February 21, 2015. Archived from the original on February 22, 2015. ↑ "Hayward helps Jazz rally to beat Timberwolves". NBA.com. December 30, 2014. Retrieved December 30, 2014. ↑ Greder, Andy (January 12, 2015). "Muhammad to miss at least two weeks with oblique strain". Pioneer Press. Archived from the original on February 7, 2015. ↑ Testfatsion, Master (January 13, 2015). "Muhammad next on Wolves to join the injured list". Star Tribune. Archived from the original on February 7, 2015. ↑ "Wiggins, Carter-Williams headline rosters for BBVA Compass Rising Stars Challenge". NBA.com (Press release). January 28, 2015. Archived from the original on February 7, 2015. ↑ "Sources: Shabazz Muhammad to have surgery, miss rest of season". Yahoo.com. February 21, 2015. Retrieved February 21, 2015. ↑ "Timberwolves Exercise Team Options on Five Players". NBA.com. Turner Sports Interactive, Inc. October 21, 2015. Retrieved October 21, 2015. ↑ "Timberwolves shock Warriors 124-117 in overtime". NBA.com. Turner Sports Interactive, Inc. April 5, 2016. Retrieved April 6, 2016. ↑ Bensinger, Ken (March 22, 2013). "NCAA to NBA millions: UCLA star's father mapped out a dream". Los Angeles Times. Retrieved March 22, 2013. 1 2 Bensinger, Ken; Stevens, Matt (March 22, 2013). "Shabazz Muhammad's new age (20, not 19) could hurt draft status". Los Angeles Times. Archived from the original on May 31, 2013. ↑ PointguardU.com Shabazz Muhammad Interview from Las Vegas. pointguardu.com. July 24, 2009. Event occurs at 0:41. Retrieved May 31, 2013.